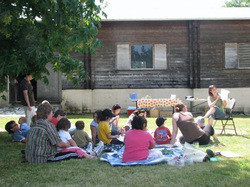 Story-time in the Park is a family literacy program that runs in the summer months, every Monday at 11 am, in the park between the Almer Carlson Pool and the North Bend hall. This much beloved program is sponsored by Free Rein Associates Ltd. in Hope. Every week a story is read aloud to the children and each family is given a copy of the book of the week to take home. There are also activities, crafts and entertainment to compliment the story. Local authors and entertainers are often featured. Story-time in the Park wraps up with a free lunch for all who attend. Throughout the school year, children can have some fun while getting exercise at Canyon Lanes. The "little" leagues that play after school are the Juniors, Bantams, Jets and the Smurfs. The names of the kids that proudly get the highest scores are published in the monthly Update newsletter. Usually once a month, Boston Bar First Nations sponsors a Youth/Family night at Canyon Lanes from 6-10pm. EVERYONE is welcome to come and join in the fun!